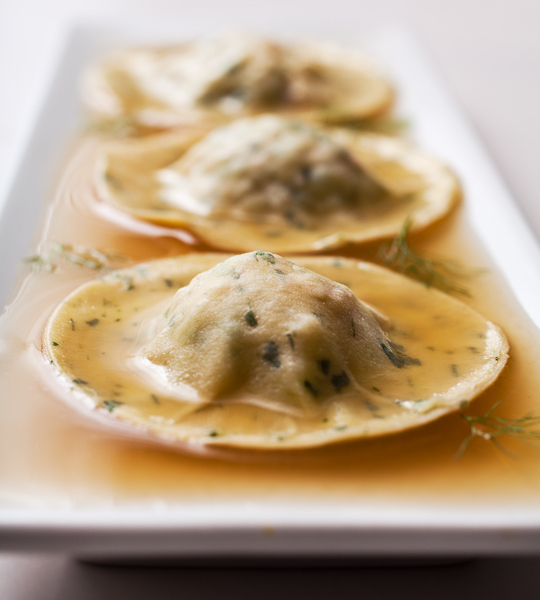 The following recipe, as it appeared in Food & Winemagazine, calls for The Ravioli Store’s famous heart-shaped lobster ravioli made as a special pasta at certain times throughout the year. Cut the lobster tail and claw meat into 1-inch pieces; refrigerate. Coarsely chop the shells. In a large saucepan. Combine the shells with the water, leeks, carrots, celery, parsley, garlic, 1 teaspoon of salt and 1/2 teaspoon of pepper. Bring to a boil, then simmer over moderate heat until reduced to 3 cups, about 40 minutes. Strain the lobster broth into a medium saucepan. Add the Napa cabbage and lobster meat and bring to boil. Simmer over moderately low heat until the cabbage is tender about 5 minutes. Stir in the lobster coral and season with salt and pepper. Meanwhile, cook the ravioli in a large pot of boiling salted water until al dente, about 10 minutes; drain. Arrange the ravioli in soup plates and ladle the lobster and cabbage broth on top. Sprinkle with the chives and serve. For those more adventurous to the left are some easy to follow recipes. The ravioli filling is matched with a dough type and a sauce for a complete meal. The ravioli freeze well as does the sauce. It is a perfect afternoon project to keep the kids out of trouble.